At the time Java is divided into kingdoms , there was two major kingdoms , namely : Boko kingdom and the Kingdom Pengging . Each kingdom is ruled by a great king . Prabu Boko Boko is the king of the kingdom . He has a form of a giant , but so his daughter Jonggrang very beautiful . Meanwhile , Prabu Damar Moyo is known as the king of the Kingdom Pengging , which berputra a knight named Bandung . According to history , which is then handed down through the generations to folklore , the two kingdoms at war with each other for territory and the reins of leadership . The idea was initiated by the struggle to Patih Gupala Prabu Boko . They were making plans , tactics , and strategy . As soon as everything is ready , Prabu Boko prepare his troops toward the Kingdom Pengging . Came the war between the two kingdoms . Boko kingdom led by King Boko own . And Pengging kingdom led by his father as a messenger Bondowoso beat Prabu Boko and his men . Both sides launched attack after attack is quite fierce . However , Bondowoso finally managed to kill King Boko . Without their leader Prabu Boko men topsy - turvy , including Patih Gupala . He fled back to the Kingdom of Boko . Bondowoso Patih Gupala pursue . Gupala duke who first reached the kingdom of Boko immediately report to Jonggrang . This dainty princess wrath knowing his defeat . He was about to beat tactical Bondowoso in Boko . Bondowoso intention to destroy the kingdom of Boko Patih Gupala and vanished as soon as he saw Jonggrang . In his vision , Jonggrang looks slick , beautiful , and charming . His heart was keen to mempersuntingnya . He turned away from its original purpose . Once Bondowoso convey his will , his daughter filed two conditions : Jalatunda well made ​​and wake her 1000 temples overnight . Because his heart was smitten beauty princess , Bondowoso accept the terms . It did not take long for Bondowoso Jalatunda to finish well . Bondowoso Jonggrang asked to go into it , and ordered Patih Gupala to hoard . Unfortunately, Bondowoso too powerful . It can not kill him . He also completed the second challenge : build the 1000 temples in one night . With the help of magical creatures , Bondowoso start working . Too early yet to come , building a thousand temples was almost finished . Jonggrang Bondowoso will feel that the successful completion of the challenge it provides. But the princess did not lost my mind . He asked for help the girls of his kingdom . They were ordered to burn the straw and mortar to pound the east . Straw burning light effect like sun would rise . Mortar - mortar that hit makes a rooster crowed . Indicates morning activity has arrived . Supernatural beings maid Bondowoso immediately went away . The supernatural beings that said it was morning , or the princess being mengerjainya . Bondowoso call Princess . Jonggrang Bondowoso and then went to say if the man was lost . However , Bondowoso Jonggrang accused of cheating . Number of temples is not even 1000, there were only 999 . Bandung wrath and curse Jonggrang so fulfilled the temple there are 999 temples . Immediately , Jonggrang turned into temples . In addition , he also condemned the girl who helped Jonggrang cheating will be an old maid not sold - life behavior . 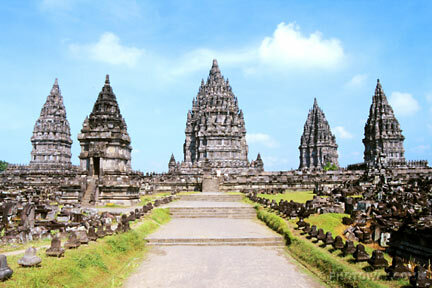 And so the legend of Prambanan Temple , Yogyakarta , occurs . Until now we still can see beauty , even though some parts of the complex was destroyed . Myths about the old maid was still attached Prambanan Area .